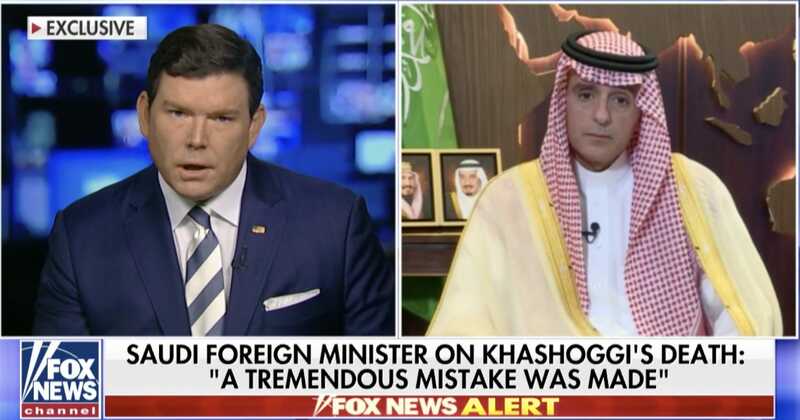 Fox NewsSaudi Arabia’s Foreign Minister Adel al-Jubeir speaks to Fox News’ Bret Baier on Sunday, October 21, 2018. On Sunday, the Saudi foreign minister denied Crown Prince Mohammed bin Salman knew of Jamal Khashoggi‘s death before it occurred in the Saudi consulate in Turkey on October 2. Saudi Arabia said Saturday that Khashoggi died after a fistfight escalated inside the consulate, but many international leaders were sceptical of that explanation. US President Donald Trump, who has been reluctant to punish Saudi Arabia for its suspected hand in the Washington Post columnist’s death, said Saturday that “obviously there’s been deception, and there’s been lies” in the Kingdom’s response to the incident. Saudi Foreign Minister Adel Al-Jubeir denied that his powerful Crown Prince Mohammed bin Salman had anything to do with Saudi critic Jamal Khashoggi’s death, and doubled down on the claim that a “rogue operation” was responsible. On Saturday, Saudi Arabia claimed Khashoggi died after a “fistfight” escalated inside the Saudi consulate in Turkey, contradicting the accusation from officials in Istanbul that the Washington Post columnist was brutally tortured and dismembered. 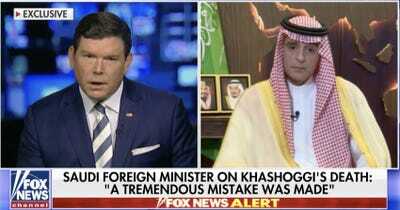 Speaking to Fox News’ Bret Baier on Sunday, Al-Jubeir said the kingdom was investigating, had arrested 18 suspects, and had fired intelligence officials. “The crown prince has denied this, the crown prince was not aware of this – even the senior leadership of our intelligence service was not aware of this,” he said. Khashoggi had entered the consulate on October 2 to get paperwork to marry his fiance, Hatice Cengiz, and never came out. Disturbing accounts from Turkish media immediately started circulating as Saudi officials said Khashoggi had left the consulate, a story that has changed over time. The official said the team rolled up Khashoggi’s body in a rug and gave it to a “local cooperator” to dispose of, then attempted to remove traces of the incident from the consulate, according to Reuters. While a growing bipartisan chorus of senators have called for the US to retaliate against Saudi Arabia’s alleged involvement in Khashoggi’s death, President Donald Trump has been reluctant to commit to sanctions or other such punishments. Republican Sen. Bob Corker took a different view on the crown prince. “Do I think he did it? Yes, I think he did it,” Corker, chairman of the Senate Foreign Relations Committee, said on CNN’s “State of the Union” Sunday. But he said he sees Trump evolving in a positive direction on the issue.